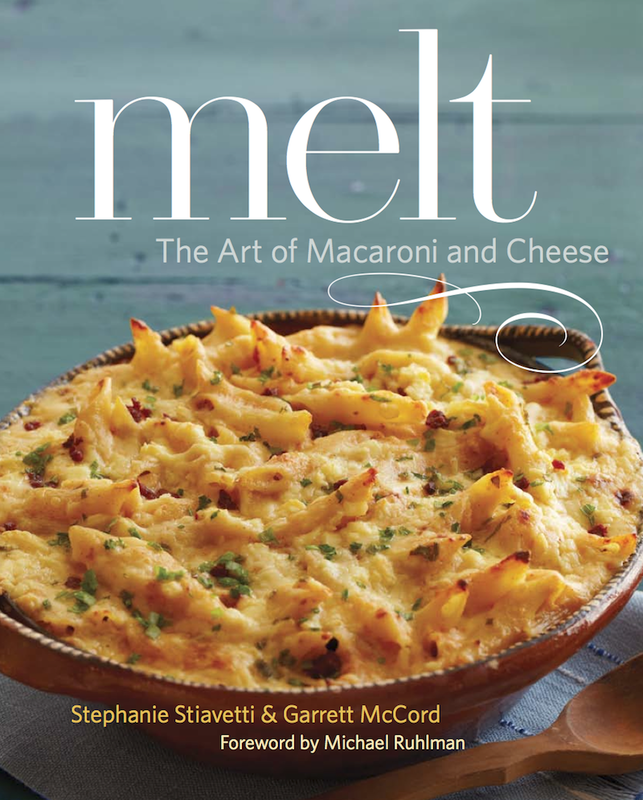 The Book: When I first heard about Melt, I was pretty skeptical about the concept of a book written entirely about macaroni and cheese. I love a cheesy bowl of pasta as much, if not more, than the next girl, but I had a hard time thinking of more than 5 interesting versions of it. Then, I met Garrett, one of the authors, during an afternoon of wine tasting at IFBC, and since he was toting around a copy of the book, I took a peek, and was genuinely impressed. Not only are all 78 recipes sufficiently interesting, the book is well thought out, well written, and packed with detailed information about dozens of different cheeses. The cheeses covered here go way beyond swiss, cheddar, and mozzarella – be prepared to be introduced to cheeses like Red Hawk, a mellow triple-creme; Idiazabal, a smoked Spanish sheep’s milk cheese; and Meadowkaas, a smooth, young Dutch cheese. 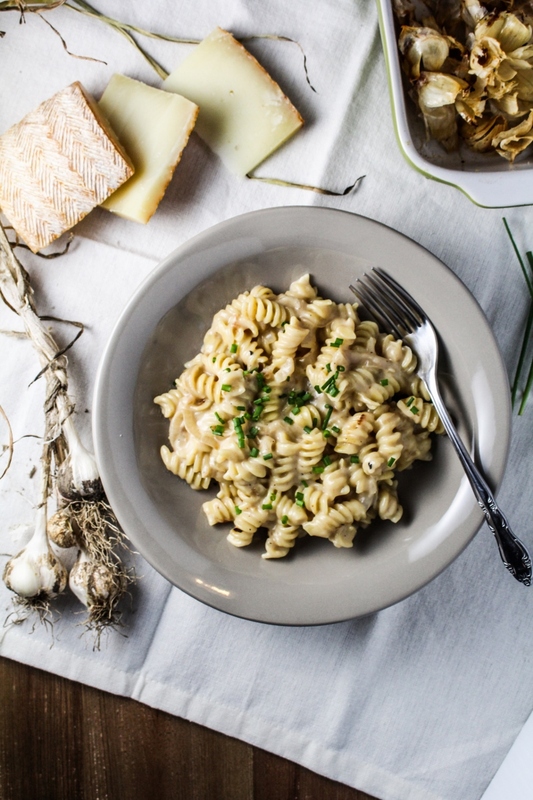 For that matter, the concept of mac’n’cheese also goes way beyond what you might expect, and any dish that has both pasta and cheese qualifies – from light, fruit-filled pasta salads, to classic stovetop macaroni dishes, to a baked pumpkin stuffed with noodles, sausage, and, of course, lots of cheese. As might be expected, most of the dishes are quite rich, and you probably won’t be able to resist cooking them, so consider yourself warned. I should note, I love a cookbook where the introductory chapter actually teaches me something, and this one passes – from the differences between cow, goat, and sheep’s milk, to how different cheese types are produced, I learned a lot (and we make cheese). And I kept learning as I flipped through the book, since every recipe includes a list of alternative cheeses, wine pairings, and food pairings for the featured cheese in that recipe. I’m so glad that I didn’t let my initial skepticism keep me from this book – it’s a good one. The Food: In general, mac’n’cheese is a pretty likable food, but I’ve had a lot of sub-par homemade versions. 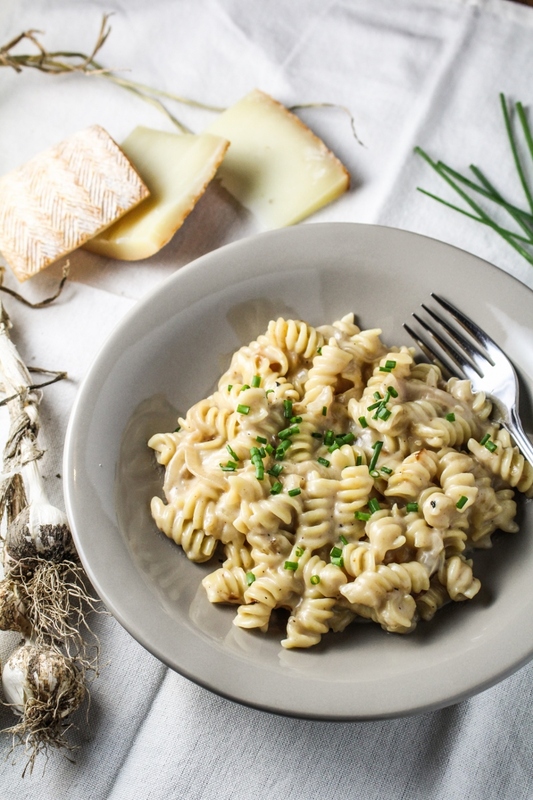 The Petit Basque with Roasted Garlic, Shallots, and Gemelli is not one of them. In Trevor’s words, it’s not “punch-you-in-the-face cheesy,” but it’s incredibly rich and thick and flavorful. The sweet, slightly burnt flavor of the roasted garlic cuts the tang of the cheese and makes for a very satisfying, very indulgent lunch. Trevor sounded like he was getting the best massage of his life while eating it, if that helps you imagine how tasty it is. The only downside? This mac’n’cheese is not cheap. The 10 oz. of Petit Basque set me back $16, which is more like what I expect to spend on two nice steaks, but if you treat it like the indulgence it is, I think it’s totally worth it. Scroll down for the recipe. The Book: Jackie Dodd, the woman behind the genius blog, The Beeroness, knows how to cook with beer, arguably better than anyone else, ever. It may sound like an exaggeration to claim that, but every single recipe on her three year old blog has beer in it, and every single one looks amazing. If I were her, I would have run out of creative ideas after about two months, but her three most recent recipes – Chocolate Stout Candy Cane Cake, Salted Beer Caramel Sauce, and Beer-Brined Paprika Chicken – prove that creativity is not a problem for Jackie. Needless to say, I was pretty excited to see that she was releasing The Craft Beer Cookbook, a cookbook full of her clever beer-infused recipes (and Trevor was excited that we were going to buy more beer). It’s a cute little book, unassuming and accessible, with dozens of recipes starring bold, rich flavors. Some of my favorite guilty pleasures are included – chipotle cream, cheese sauce, carbonara – all somehow imbued with beers ranging from pale ales to chocolate stouts. A lot of the recipes are for what might be considered “football food,” and they certainly tend toward the indulgent, but the occasional lighter choice, like IPA Watermelon Ceviche or Strawberry Pale Ale Popsicles, mixes things up. Since I’m not much of a beer-drinker, I like that this book forces me to think about beer at a deeper level – what flavors are present, how heavy is it, how carbonated is it? – in order to successfully incorporate it into food. And I think it would be a perfect gift for anyone you know who loves beer and is mildly interested in cooking, as the recipes are pretty straightforward and highly craveable. The Food: Although it was hard to choose whether we wanted to indulge in Chorizo Stout Sloppy Joes or Croque Madames with Beer Cheese Sauce to review this book, we went with the Croque Madames. 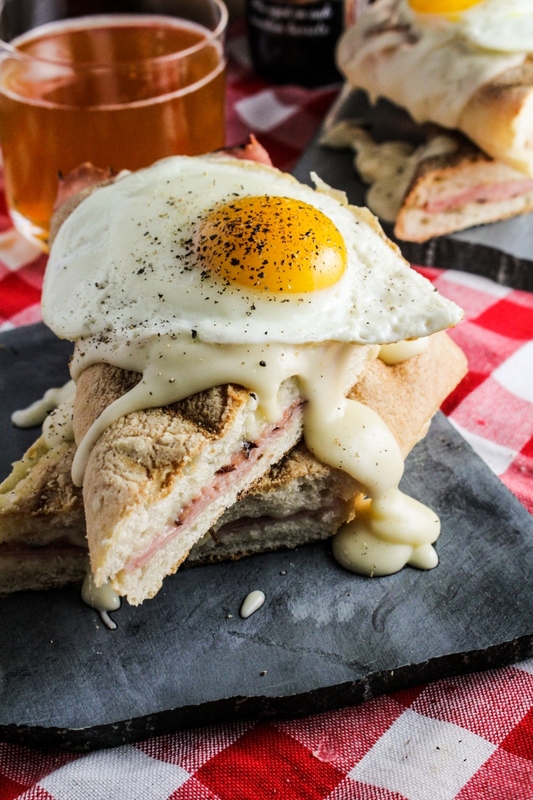 Croque Madames are a simple French sandwich of ham, swiss, and a fried egg, often served with bechamel sauce. 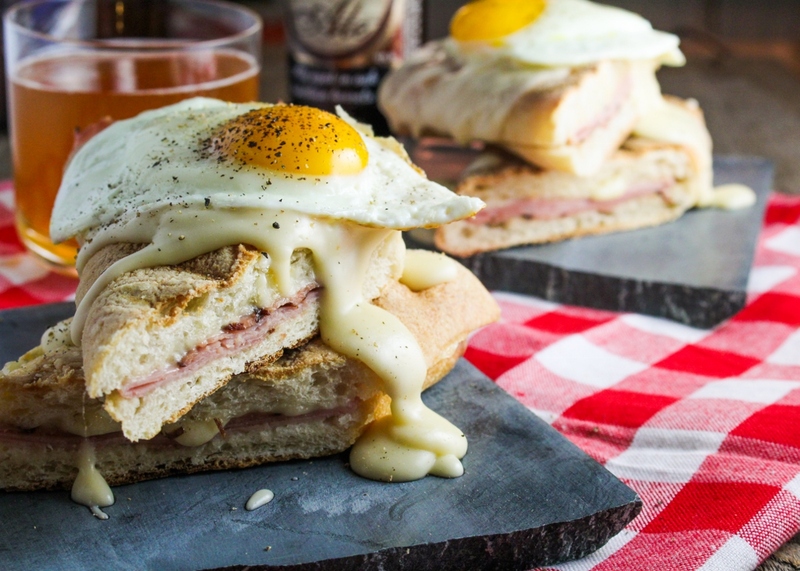 Jackie turns the bechamel sauce into a rich beer and cheddar sauce that gets drizzled over the sandwiches, and takes the whole thing over the top. I loved how easy these were to make – you just whiz the cheddar, milk, flour, and cornstarch in a blender with your choice of blonde ale, then heat with melted butter until thickened and spoon over your grilled sandwich. The beer gave the cheese sauce a noticeable and pleasant tang, making it far too easy to eat a few extra “test” spoonfuls, and I would absolutely make it again… I have the feeling it might be the recipe we turn to the next time we had a few too many beers the night before. Scroll down for the recipe. Disclaimer: I received a review copy of these cookbooks from Little Brown and Company and Adams Media free of charge, but was not otherwise compensated for writing this review. Recipe from Melt. Serves 4. Note: Alternate cheeses for the Petit Basque include Barinaga Ranch, Abbaye de Bel’loc, or another caramelly Basque-style cheese. Preheat the oven to 400°F. Peel off most of the outer paper of the garlic heads, but leave the heads in one whole piece. Trim off the top 1/4 inch of the garlic with a sharp knife, slicing to reveal the tops of the cloves. Place the heads in a small baking dish, drizzle with 2 TBS of the olive oil, and cover with tinfoil. Roast for 1 hour, or until garlic is soft. Once garlic is cool enough to handle, remove from the oven and take the cloves out of the skins (they should separate easily, or you can squeeze them out). Mash the garlic cloves up and set aside in a bowl. Bring a large pot of salted water to a boil, and cook the pasta until al dente according to package directions. Drain and set aside. Heat the remaining 2 TBS of olive oil in a small saucepan. Add the diced shallots and cook until golden-brown, about 4-5 minutes, stirring frequently. Remove from the saucepan and add to the bowl with the garlic. Add the milk to the saucepan and heat over medium-low heat until it just begins to steam and bubble, then pour into a bowl and set aside. Melt the butter in the saucepan over medium heat. Add the flour and cook until nutty-smelling and golden brown, about 2-3 minutes, stirring the whole time. Slowly pour in the warm milk, whisking to incorporate as you do. Cook the milk, still whisking, until is thick enough to coat the back of a spoon. Remove from the heat and stir in the garlic and the shallots. Season to taste with salt and pepper, then stir in the shredded cheese until completely melted. Toss with the cooked pasta and serve immediately, sprinkling each bowl with chives. Recipe from The Craft Beer Cookbook. Serves 6. Add the beer, cheddar, milk, flour and cornstarch to a blender, and process until smooth. Melt the butter in a medium saucepan over medium heat, then add the blended cheese mixture to the pot. Cook, whisking continuously, until the cheese sauce has thickened to a spoonable consistency, which should take about 6-8 minutes. Once the sauce has thickened, remove from the heat and set aside. Split the buns in half and evenly divide the ham and Swiss cheese between the sandwiches. Close the sandwiches and cook on a panini press or bake in a 375°F oven until the cheese has melted (about 5 minutes in the oven). In the meantime, fry the eggs over medium heat in a frying pan that has been sprayed with cooking spray, removing the eggs from the heat when the whites have set but the yolks are still runny. Slice the sandwiches in half on the bias, then place on a plate and serve topped with generous spoonfuls of the beer cheese sauce and a fried egg. Serve immediately. 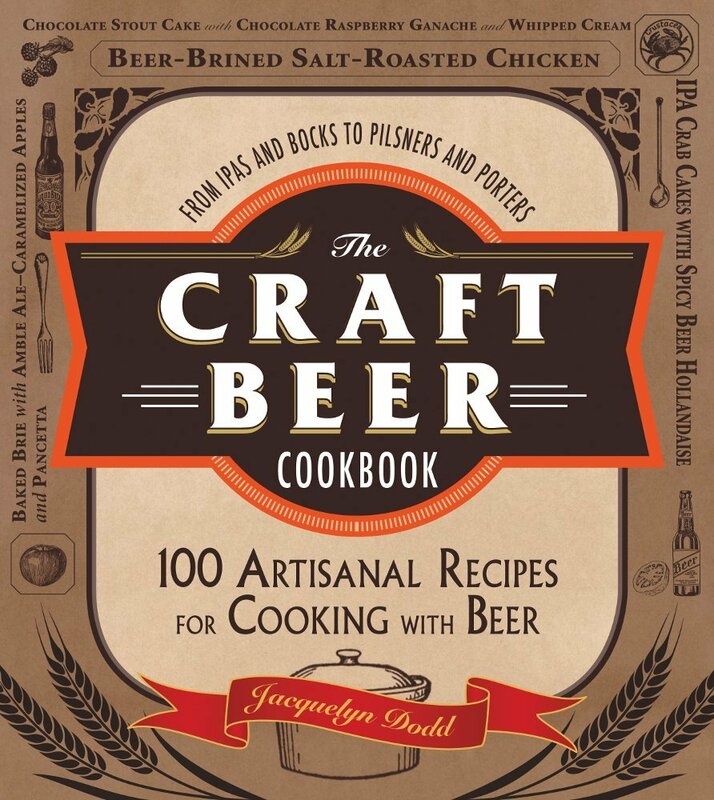 I saw that Craft Beer Cookbook online a week or so ago and have been dying to check it out! Thanks for the reminder. I’m loving these reviews! Jackie’s blog is pretty new to me, and I already want that book!